Dennis Bauer, a major force in the custom sign industry, will soon retire. We wish to recognize and honor Dennis and thank him for the positive and long-lasting impact he made on the industry, our Company and on many individuals. Dennis’ tenure with Poblocki has lasted 31 years and he is currently our Vice President of Exterior Operations. He began in the sign industry with a start-up company in 1973, and by 1980, that company grew quickly to about 90 people. Dennis then was selected to start a manufacturing facility in Houston, and in 1983 that company became the Milwaukee Sign Company. In 1987, Dennis was recruited by Jerry Poblocki to lead the manufacturing operations for Poblocki & Sons, then a company of 36 people. Dennis was a perfect fit for the growing Poblocki & Sons enterprise, as his significant sign knowledge and experience complemented the knowledge and skill he saw in the heads and hands of his Poblocki teammates. It was a time of significant growth for him, the Company, and the entire custom sign industry. Dennis found himself leading the charge at Poblocki and became a nationally known resource within the industry. Dennis’ competitive nature, practical experience, and creative problem-solving skills enhanced our reputation as one of the leading sign companies in the country. The word “No” and the phrase “can’t be done” was replaced by Dennis’ “can do” attitude and performance. Dennis, and Poblocki, earned the reputation for always finding a way to get a project done and done right. In the early days of his Poblocki career, Target and Kohls were some of our major accounts. 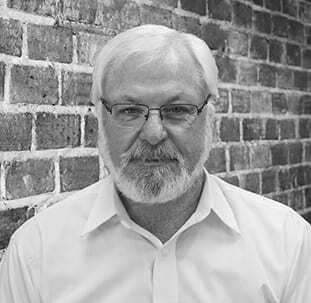 Dennis was instrumental in determining how to approach and deliver on the projects in a cost-effective way without sacrificing quality. With many custom sign projects, the installation component is as challenging as the fabrication, and Dennis took great pride in the problem solving required to install signs. In 1995, Dennis was proud to be intimately involved in designing and building our new facility in Milwaukee. Some of his most memorable projects were the Willis Tower Globe in Chicago, the Trump letters on Trump Tower in downtown Chicago, the Baylor Medical facility in Dallas, the Pabst rotating sign in Milwaukee and the 900 N. Michigan overhead digital displays on Chicago’s “Magnificent Mile”. In his time here, Dennis was adept at developing vendor and installation partners that allowed us to build and install complex signage projects. He was thrilled to be involved with the ISA’s (International Sign Association) Technical Committee and treasures the relationships he developed through his national work with the ISA. To Dennis, being a contributor also meant developing skills in others. He nurtured many individuals and helped them grow into leadership roles. He managed many teams and was influential in the careers of many. From all of us at Poblocki Sign Company, we wish to thank Dennis for his dedication, thoughtful leadership, ingenuity and talents that helped build the Company to what it is today, and one that is known for “Finding a Way”. Dennis’ fingerprints on the teams are long-lasting and ever-growing. We wholeheartedly agree with Dennis’ farewell words, “It’s been a great ride. Going to miss it.” Dennis will indeed be missed, but his legacy will continue.